I want you to know how important it is for me to be alone with God in my Sacred Space each day. This time apart from you and daddy, your brothers and sisters, isn’t because I don’t like you or I don’t want to be with. On the contrary! I am going to be intentional about communing with Jesus so that I am a better mommy, a better wife, a better friend. Without solitude it is virtually impossible to live a spiritual life. We do not take the spiritual life seriously if we do not set aside some time to be with God and listen to him. During this time waiting for you, I have been led by the prompting of the Holy Spirit to wake up hours before sunrise, to light a lone candle, to climb the steps to a secluded landing, and to seek God each morning. Sometimes I pray, or read a daily devotional, oftentimes I participate in the Daily Prayer and read the daily office of lectionary Bible passages. Some days I write feverishly in my journal – confessing my sins, pouring out my pain or documenting a moment of clarity from Scripture. Some mornings are still, and when I seek his voice I only hear the bubbling of the fish tank. Other days my soul stirs with God’s whispers, promises or urgings or convictions. Whether my devotional hour feels productive or not, I remind myself that God receives my offering of time, even if my mind wouldn’t stay silent enough to hear a revelatory message. It is a slow, calm, quiet start to my day, a gift I never allowed myself to experience before. BUT GOD IS FAITHFUL. He is also merciful and patient. He won’t chastise me for not having my life in perfect order once I have other lives to care for night and day. He will grant me the time and space and wisdom to meet with him in our Sacred Space. ONE MORE THING, Child! 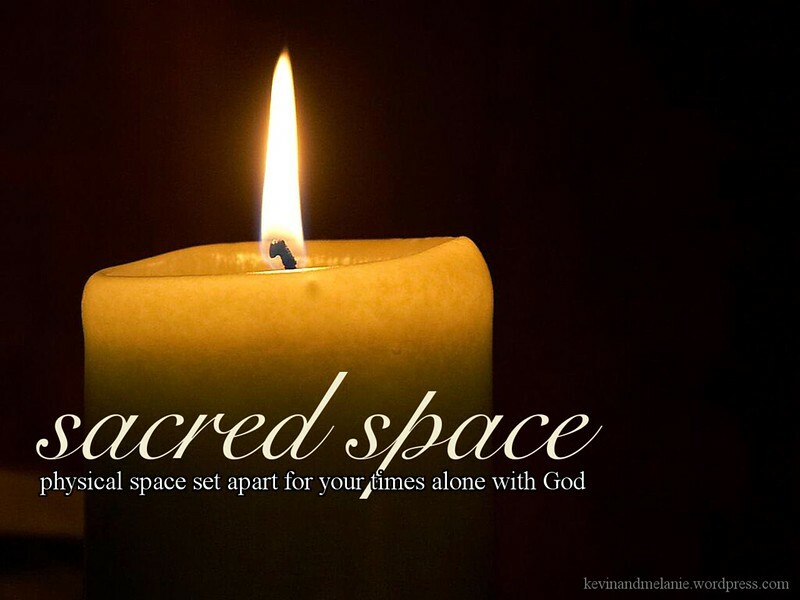 If and when you feel led to create your own Sacred Space for time alone with God, please do so. Come tell me, “Mama, I’m going to have my God-time now” so I know better than to disturb you with menial tasks that can wait. Let me know if you have questions about this, tell me what your learning, share with me your need for direction or guidance. I will do my best to set an example, and I will do my best to answer your questions, and I will do my best to surround you with godly men or women who can join us in this journey toward Jesus.